Ultra marathons are 26.2188 mi or longer and many endurance runners go even farther. They run like crazy, and perhaps they literally are. I’m not an endurance runner, but I aspire to be one when I grow up. In the meantime, I like keeping abreast of all their accomplishments and allow myself to be simply inspired to run harder, faster, longer. If they can do it, I can at least run around the block right? Below I’ve listed some links to my favorite inspirations to get out and run! Beyond running, they make me feel like I can do just about anything. This is such a great segment on what an ultra marathoner goes through while racing. Its so interesting to hear the battles that they face mentally, not to mention the obvious physical strain—some overcome, some don’t, but intriguing just the same. Run The Sahara (50 miles per day in 100 days). A documentary narrated by Matt Damon that follows three men as they attempt to run across the entire length of the Sahara Desert. This documentary features a Swiss couple, Serge and his wife, Nicole, who teamed up with a Swiss children’s charity and sold everything they had to fund their adventurous journey to “help the children.” Serge ran through 33 countries and 25,400 miles in five years, with Nicole by his side on a Yamaha motorcycle. See website for more and trailer below. Tony Krupicka, ultra marathoner, cuts the off the soles and removes the tongues of his shoes to create a more comfortable platform for running. See this trailer for this documentary. Looking to participate in an awesome endurance race? 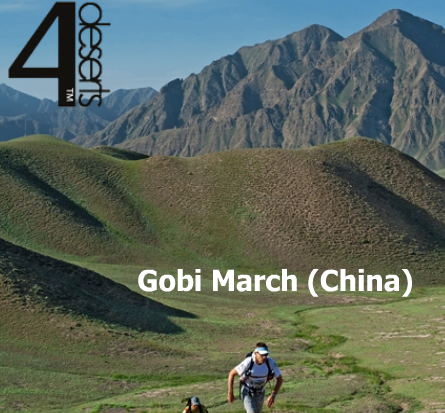 See the 4 Deserts Race website for more info. Definitely a ‘Bucket List’ item. @Natalie: I have seen Spirit of the Marathon and loved it! Nothing better than watching that on a Friday night to get you pumped for a long run on Saturday morning! I’ve only ran a Trail Half Marathon—which I didn’t train very good for. I had only run 6 miles before running it—silly me. I totally ruined my hip for a few months after that race, but at least I finished! Now, I refuse to torture my body that way. The hubby and I are really into barefoot running now…actually barefoot…no shoes at all! We love it, but apparently you can’t run farther than 10 miles without some sort of protection for your skin. We’re thinking duct tape will do the trick! It’s great on the joints and my husband has no knee pain when he does. We want to do a barefoot marathon at some point—not ready right now, but we need to start training!